I love summer. Whilst we don't always get the most of the sun though over here in the UK, we know how to make the most of it when we do. When it comes to makeup, I love bringing out my bright and colourful products, which is why, on this hot and sunny day, we're going to be looking at a very vibrant pot of pigment. Jelly Pong Pong's Paradise Pigment pots come in two super bright, cream shades that are designed to be used on both the lips and the cheeks to add a flush of summer. There is Cake Pop a bold pink-red coral and Fig Jam, a vivid purple-pink orchid. Whilst the name Cake Pop reminds me of Clinique's Pop range, I really love the name Fig Jam. Anyone else!? Both shades may look a little daunting in the pan, but rest assured that they don't apply that brightly on the face. Each pot contains pumpkin seed oil and rhubarb extract for "plush, cushiony skin". I received the shade Cake Pop in my June Birchbox, so if you'd like to subscribe to see if you receive one too, you can subscribe to Birchbox here. They come packaged in a small, clear jar with a black screw cap lid that holds 4g of product. The main thing to keep in mind with these pots is this: they are very highly pigmented. I recommend using only a quick dab of this pigment - when they say a little goes a long way, you better believe it! Use a few dabs and you're going to have very bright cheeks indeed (but if you want that then by all means, dab your heart out, honey!). Taking inspiration from the video on the Jelly Pong Pong Paradise Pigment product page, applying this pigment with a brush to the back of your hand first to soften the colour before using the same brush to apply to the cheeks may be the best way to go. I have also applied it with a blending sponge and that turned out pretty well also, so experiment and see what works best for you. On the lips, you can apply it with your finger or a lip brush. Other than the colour, the first thing that you notice upon opening is that the formula has a fruity bubblegum type of scent that reminds me of my childhood. It's a fun, carefree type of smell that makes you smile. On the lips, the Paradise Pigment has a matte finish that has some great staying power. There is a little bit of transfer onto cups and such, but it doesn't ruin the finished look. A blot on some tissue may be a good idea when you use it. I apply it with my ring finger for a more casual look, but it can be applied with a brush too for a more defined finish. Again, it can be built up to a very bright, heavy finish. Here it is swatched with a small amount and with a heavier amount. Keep in mind though that the second photo doesn't give enough justice as to how bright it actually is on the lips. Whilst it does have great lasting-power it is still easy to remove, so there is no need to worry about it staining at the end of the day. Nice! On the cheeks, you really have to remember how pigmented it is! With that said though, it is blendable and can be fixed if you have a bit too much on the skin, but you'll need to act fairly quickly. Once on, it gives a beautiful, summery flush of colour that lasts all day. 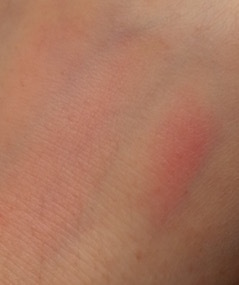 Here it is swatched on the back of my hand, more blended out on the left and a bit heavier on the right. I love how you are really in control of how you want this product to look. You can wear it as sheer or as bold as you like, taking it from daytime to nighttime wear. You don't need multiple items to create that subtle look or a fierce one, it's all there in these little pots. Do I recommend these pigments? Absolutely! Have some fun with them and create your own look for summer. Whilst I currently only have Cake Pop, I now desperately need Fig Jam in my life - and not just for the awesome name. 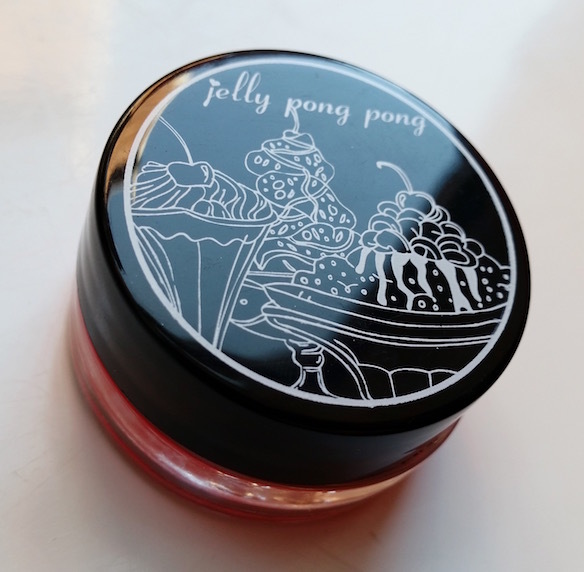 You can purchase the Jelly Pong Pong Paradise Pigments from Birchbox. What are your thoughts on the Jelly Pong Pong Paradise Pigments? Which shade is your fave?